Do Tear Stains ruin the looks of your beautiful dog? Primalix Tidy Tears for Dogs is a real solution dog owners can count on. What Is Primalix Tidy Tears for Dogs (and Cats)? Primalix Tidy Tears for Tear Stains in Dogs is our proprietary formula of USDA Certified Organic herbs, antioxidants and phytonutrients. Each ingredient is clinically proven to activate natural canine defenses and balance biological systems to restore wellness. Primalix Tidy Tears was developed specifically for all small breeds of dogs and brachycephalic cats. How Does Primalix Tidy Tears for Dogs Work? Its powerful herbal nutrients work at TWO CRITICAL LEVELS: First, it disinfects the microbial breeding ground at the root of the problem by killing the bacteria that, when interacting with yeast in the affected areas, cause the formation of pigment and subsequent staining. Then it balances the immune system for optimum wellness, preventing relapse and providing long-term maintenance through your pet’s own natural defenses. So PrimalixTM Tidy Tears for Dogs Is NOT Just A Cover Up! We understand the pathology from the inside out. That’s why our proprietary formula is NOT a cover-up for dog tear stains that only masks the underlying cause; NOT a superficial “remover” that bleaches the stain but leaves the undiagnosed infection to fester and grow; and DEFINITELY NOT a farm-animal-grade antibiotic (like in that other popular brand) that kills friendly probiotics and disables your dog’s GI tract from absorbing vital food nutrients. And it contains no harmful steroids! What Are Some of The Causes of Tear Stains? There are a number of causes of epiphora, the disease characterized by excessive tearing with classic red/brown staining "flowing" from the eyes. But the WORST thing you can use to kill this modest bacteria is an antibiotic intended for food livestock. Tylosin as Tartrate, Tetracycline, and Lincocin are harsh antibiotics used in other tear stain products that can cause a suppressed immune system, a compromised gastrointestinal tract, ulcerative colitis, colon cancer, intestinal candidiasis, damage to bones and teeth of fetuses, decrease of B vitamin levels, kidney damage, hepatitis, low white cell count, aplastic anemia, diarrhea, pancreatitis, diabetes mellitus, headache, nausea and vomiting. Primalix Tidy Tears Are Safe and Natural! With no harmful antibiotics, our proprietary, full-spectrum herbal extract formula for dog tear stains is safe enough to use on puppies, yet effective enough to assure that new hair growth will be tear-stain free, 100% naturally. What Is IN Primalix Tidy Tears? Contains Grapefruit seed extract from USDA Organically grown grapefruit (a natural destroyer of Gram positive bacteria, the specific bacteria at the source of dog and/or cat tear stains); Astragalus membranaceus (which stimulates the "germ-eating" white blood cells known as macrophages, activates T-cells and natural killer (NIK) cells, and increases the production of immune globulins); Taraxacum officinale (Dandelion Root), which promotes bile production and stimulates cell metabolism in the body, helping the body to dump metabolic waste into the blood to be cleansed by the liver; and Arctium lappa (Burdock root), which works through the liver and kidneys to correct and guard against the build-up of waste products. Is It Really Only $39.95? NOTE: All Primalix products give you 2 to 4 times more medicine than our competitors' 1 or 2 ounce bottles that cost about the same and some competitors contain harmful alcohol. Don't let your dog suffer with tear stains. Fix tear stains at their root! 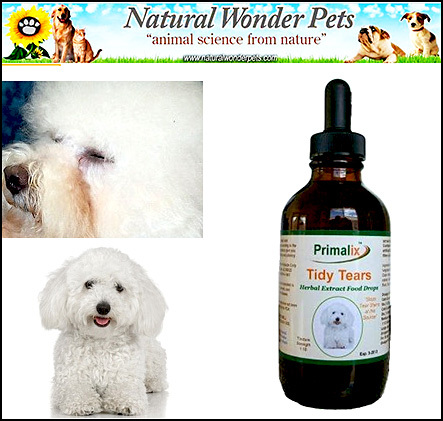 Call us today and order Primalix Tidy Tears Herbal Extract Functional Food Drops today!